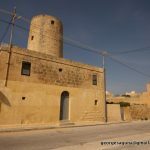 L-Għarb means West and this typical old Gozitan village unsurprisingly lies in the West of the Island. It started life as a small hamlet centuries ago. 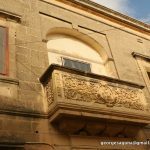 You can see its ancient roots in the centre of the village where some houses have fine examples of decorated stone balconies. 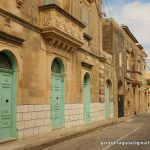 The population of l-Għarb is of about 1266 people with a total of 400 families. 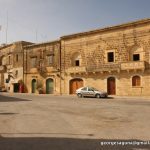 The area of l-Għarb is about 14.3sq kms. 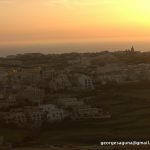 L-Għarb is surrounded by two villages, that of St Lawrence and Għasri, and the sea. 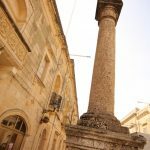 L-Għarb was made a parish in 1679. This triggered the need of building a new, baroque parish church. 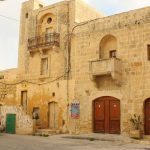 It was built between 1699 and 1729. The church has an elegant facade which has been compared with Borromini’s S. Agnese in Piazza Navona, Rome. This version is naturally a simpler interpretation of the style. During excavation works at ‘il-Mixta’ of Ghajn Abdul, in Neolithic times according to Dr Trump, pre-historic pottery was found. This means that people lived here between 3800 – 3630BC. 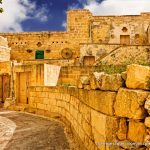 From these excavations made by the department of Museums, results showed that people used to live in these caves also during the Bronze Age between 1630 – 800BC. 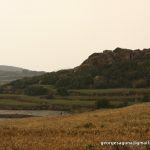 In the areas of Dwejra and San Dimitri there are signs of car ruts on rocks, which today are buried beneath road surface. 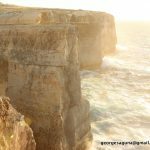 Some people think that the Phoenicians on their journeys to the west used to live in Gharb from where they planned their sea journeys. 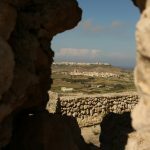 A book written by the Maltese author Antonju Caruana – ‘Sull’Origine della lingua Maltese’ says that remains of the Phoenicians were found in Gharb. 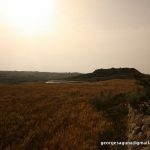 Can G. Piet Agius de Soldanis says that ‘ix-Xaqqufija’ in Gharb is a small place where Romans used to live. 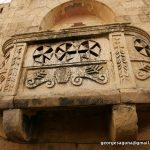 In Gharb there were also Byzantine names like ‘Kardusa’ near San Dimitri. Chev. Vincent Bonello says that it might be possible that around the 7th Century, after being expelled from North Africa, some monks might have built chapels or monasteries in these areas. It could also be possible that the Byzantine inhabited the Islands before the Arabs did. After the Arabs took over these islands Arabic became the official language. 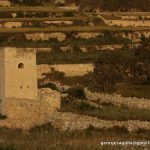 Some old people from Gharb, more than any other villages in Gozo, are still using some of these words today in their day to day life. 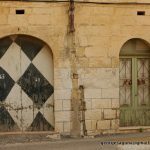 Words similar to ‘Wied id-Dluka’, ‘Wied ir-Rahab’, ‘Ghammar’ and ‘cuplajs’, ‘srew’, ‘ghannewwel’ etc could still be heard in Gharb. 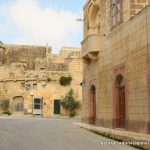 About 80 years ago the people of Gharb used to wear the ‘kabozza’ in the cold winter nights. 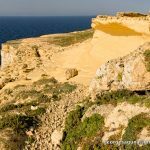 The Arabs introduced ‘The Kabozza’ in these islands and in these islands it was associated with the village of Gharb. 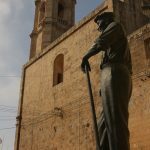 Mikiel Anton Vassalli a studier of the Maltese language came to Gharb to hear the old and pure Maltese language as spoken by the old villagers of Gharb. 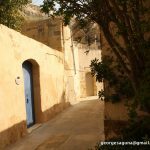 Fr Manwel Magri came to Gharb for the same purpose, to record old words, legends and proverbs from our fore fathers, when Archpriest Fr Carmel Portelli was still alive. 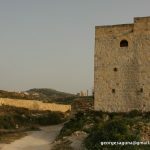 The tower of Dwejra was built in 1651, during the days of the Grand Master De Paule and two canons were erected. 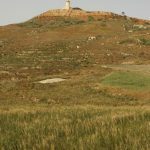 There was another tower on ‘Ta’ Dbiegi’ hill but it perished during an earthquake. The Cemetery by the Church was constructed in the year 1703 and came to cost around 150 ‘Skudi’. It was extended on the 26th June 1814 and was blessed by Bishop Ferdinandu Matti. This cemetrey was used for those who died of contagious illness. 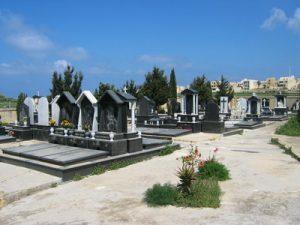 From the 1st of January 1935 all dead people of Gharb and St Lawrence started getting buried in this cemetery. On the 29th July 1942 the Church and even the cemetery were greatly damaged by German bombs. 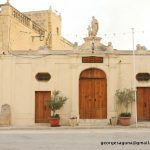 This Church remained parish for about 50 years, when in 1698 the people of Gharb sent a request to Grandmaster Raymondu Perelli as to be given a site for a new church to be built. 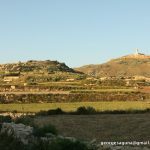 After Gharb became a parish the villagers needed to plan a new church. On the 27th September 1698 the Grandmaster gave permission and choose the site called ‘ta’ Nawrata’. 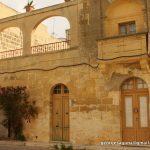 Architect Guzeppi Azzoppardi made the plans as ‘iz-Zghir’ from Birgu Malta. 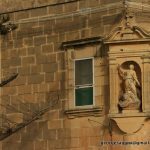 The builder Dijonisju Carnemolla from Gharb began the works and encouraged everyone to help in the building of the new church. In 1699 the parish priest, Fr Gamri Camilleri with the permission of Bishop David Cocco Palmeri put some coins and silver medals under the foundation stone. The works continued for 15 years and stopped for about 10 years when the builder died. In 1717 the parish priest Guzepp asked the Grandmaster to give him 4 tumuli for the church parvis. On April 1717 the works on the building started again. Fr Frangisk Adeodatao Formosa vicar of the Bishop of Gozo blessed the main altar, celebrated the mass and put the Blessed Sagrament in the Tabernacle. On the 26th October 1729 the church was consecrated. On 19th May 1774 POPE CLEMENT XIV raised the church and on the 2nd October 1774 the first Cannons took their possession. They served as priests by saying the Office for 23 years. The bells were made in 1732 and coasted 3800 ‘skudi’. The big one weighs 2448kg and cost 125 ‘skudi’. These were raised to steeple by the people themselves using beast and other tools. The organ was used for the 1st time on the 15th September 1912. On the 3rd January 1963 Pope John XXIII nominated the Arcipriest as Protonaotary Apostolic. At that time Can Arcipriest Fr Guzepp Borg was the Arcipriest. On the 28th November 1967, it was joined with the great devotion Ta’ Pinu Basilica with all honors and privileges of a minor Basilica and the chapter became to funcion in the same Basilica. It was Christmas 1971 when the Hebron choir under the direction of canon Hon Achille Cauchi sang for the first time in the parish church. The clock with the new machinery started to tick regularly on the 19th March 1972 after Bishop Cauchi blessed it. With the zeal of the Arcipriest and the generous contributions of the people of the village the sum of Lm 748.32.9 was collected and today we have a clock that one can rely on for time. Mr Emanuel Scembri contacted various clock factories so that we could be sure to have a good one. Bishop Molina decided to raise the church to a Parish owing to the number of people (300) who were eligible to receive communion. 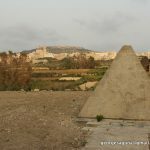 Besides the village of Gharb was 3 miles away from the Cathedral and people who died at night couldn’t receive the Blessed Sacrament. 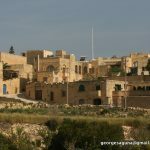 After being assured that the parochial community of Gharb could financially maintain a parish priest, Bishop Mikiel Glormu Molina declared Gharb as a parish on the 29th August 1679. 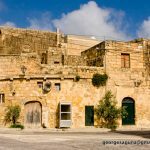 The apostolic Administrator for Gozo, Mons N G Cauchi Ph.D. Lic. Sc. Soc. 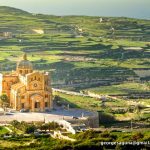 Titular Bishop of 7 Vico D’Augusto Raised Gharb parish church to a Basilica to the joy of the villagers. The fields were tended wisely and with care. 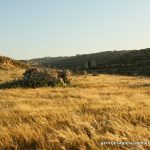 Work in the fields started from sunrise to sunset and during harvest time the farmers passed their days in the fields without resting. Work was hardest in summer especially during threshing time. When everything had to be done by beast and men. In time of drought products were scarce and when rainfall was abandoned and crops were plenty the farmers had to sell them at a cheap price or give them to charities. Every evening all the family had work to do and the women used to work lace or separate cotton from its pod. Long ago every quarter of the village used to light a bonfire on certain feast days. 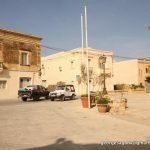 At the quarter knows as ‘Tal-Fgura’ the feast of St Joseph ( 19th March) was celebrated, ‘Ta’ Trux’ had San Dimitri (2nd Sunday of October) and ‘Ta’ Ghammar’ St Publius (2nd Sunday of September). 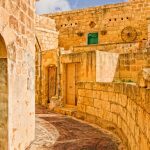 During the titular procession of the village of Gharb the dawn and the fife were used instead of an orchestra during Vespers and Benediction. 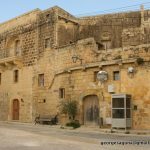 In 1834, musicians were brought over from Malta until Gozitans were trained and started taking part in village feasts. Spiritual exercises were held before feasts. Can Prep, Nikol Axiak left a legacy to pay for these services. The best preachers were chosen. 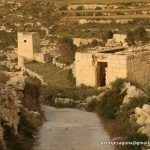 As we have seen up to now our village is one of the oldest in the island. As from long ago there was a great devotion to the Visitation of Our Lady to St Elizabeth and cause of the great graces received all those who requested her help it was called ‘Virtu’. Today’s church is built on the ruins of another one. The previous one was profaned by Bishop Baloguer that the new church must to keep going the great devotion that the old one had. The permit was given on the 17th June 1663 from the same Bishop Balaguer. In 1675 it began to be constructed and was ready by 1678. The money for its building was raised from collections by the village people. The Apostolic visitor Mons Pietru Duzzina renamed ‘Tal-Virtu’. 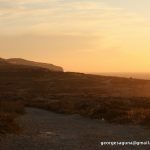 On the 29th August 1679 Bishop Mikiel Glormu Molina declared it a parish with Dun Ganmarija Camilleri as its first parish priest. On the 23 March 1688 the altar dedicated to St Francis of Assisi was previously dedicated to Our Lady of Rosary. The other altar of St Mary Madden was dedicated to the souls in Purgatory. 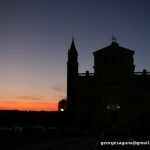 On the 29th July 1842 Pope Greogory XIV gave Plenary Indulgence to everyone who visited this church in the seven main feasts. The titular feast was held with great devotion and even fireworks were used. BISHOP GM CAMILLERI OSA blessed the big bell of this church on the 16th June 1902 and Archpriest Frangisku Saverju Debrincat paid half of its cost. Luigi Boero of Genoa made it. In 1904 the steeple was built together with the Chapel of Our Lady of Sorrows. 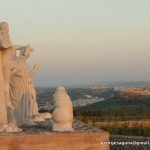 Ta’ Pinu Sanctuary is a place of great devotion and of national importance and is visited by numerous persons all year round, both locals and tourists. Various pilgrimages are held to the Sanctuary. This sanctuary is an extension to a chapel which is still found in the inner northern part of the sanctuary. 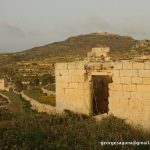 This was the chapel from which back in 1883 Karmni Grima a saintly woman from Gharb heard the voice of Our Lady talking to her asking her to recite three Holy Mary’s for those three days spent within the tomb. The parish church of the locality, is dedicated to the Visitation of Our Lady to St Elizabeth. The feast day is on the 31st May of every year and the outside festivities are held on the first weekend of July. This chapel which is the chapel of the cemetry of the Locality was also the old parish church of the locality, before the new one was built. It is called ‘taz- zejt’ because of a legend that says that an old woman was cured when she spread over her body some of the oil that used to ooze out the church’s side. 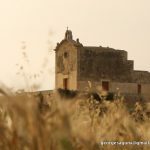 There is a legend related to this chapel, in which it is said that an old lady called Sgugina who had her son stolen by the Turks was praying San Dimitri in this chapel and the saint was seen coming out of the titular painting of the chapel and returned bringing back home her son. The feast is held annually on the second weekend of October. 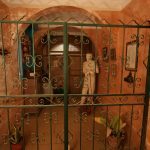 This museum is found at the beginning of the village and is the same home where Karmni Grima, the saintly lady who heard the Holy Mary talking to her used to live. In this musuem one can find various personal belongings of Karmni. Opening Hours: Sundays between 10.00am – 12.00pm except every 4th Sunday of the month. Tel: 00356 21556187 (for special group bookings). This museum is found in the village core. 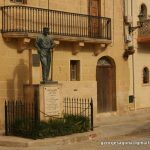 It is the same home of Frenc Mercieca better known as Frenc ta’ l-Gharb, a saintly man, who lived some years ago (1892 – 1967) and who cured a lot of people with his prayers and his faith in Our Lady. Tel: 00356 21553109 (for special group bookings). 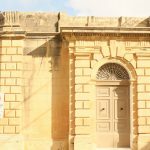 This is a private owned museum found in the core of the village with 28 rooms filled with all kind of antique tools and prestigious items. Click here to view the site . For more information please call on telephone number: 00356 21561929. 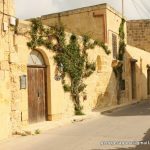 In our locality one can also find Ta’ Dbiegi crafts village situated at Frangisk Portelli Street where various crafts are made. Amongst others one can find hand-made pottery, hand-blown glass, lace-making and filigree. 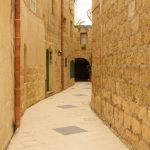 One could mention that in Gozo, crafts like glass blowing and pottery are only found at Gharb. Another attraction not very well-known but yet not to be missed is a window formed in the rocks at the cliffs at Wied il-Mielah. 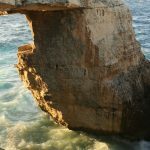 This ‘window’ is very similar to the popular one found at Dwejra known as the Azure Window. 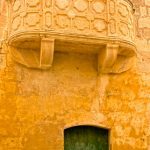 At Gharb one can note various old and sculptured balconies found in some of the oldest homes around the village.